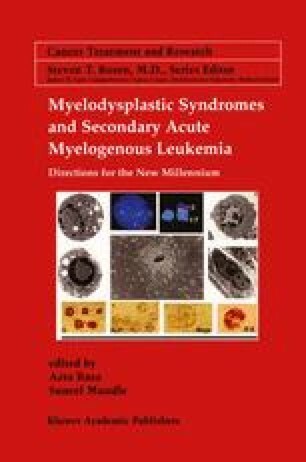 The myelodysplastic syndromes [MDS] and acute myelogenous leukemia [AML] occurring subsequent to toxic exposure constitute the clinically apparent secondary hematologic disorders [sHD]. The incidence of these disorders has significantly increased during the past 40 years. This increase is most likely to be due to at least two phenomena: 1) increased exposure of individuals to hemopoietic toxins as part of treatment for malignant or autoimmune diseases; and 2) the increasing age of our population. It is generally assumed that “spontaneous” myelodysplastic syndromes (no history of toxic exposure) in the elderly are actually the result of a lifetime accumulation of genetic damage resulting from repeated low level toxic exposures in the environment. Despite there being some differences in the frequency of specific chromosomal abnormalities between secondary MDS [sMDS] and spontaneous MDS, these two entities are similar in terms of stem cell involvement, the characteristics of the marrow and peripheral blood, and the clinical courses of these two syndromes. In this chapter these two “types” of MDS, will be considered as one.